Let’s just get one thing out of the way: the title of the book and the setting: First, there are mountains in Portugal, but they’re not that high. 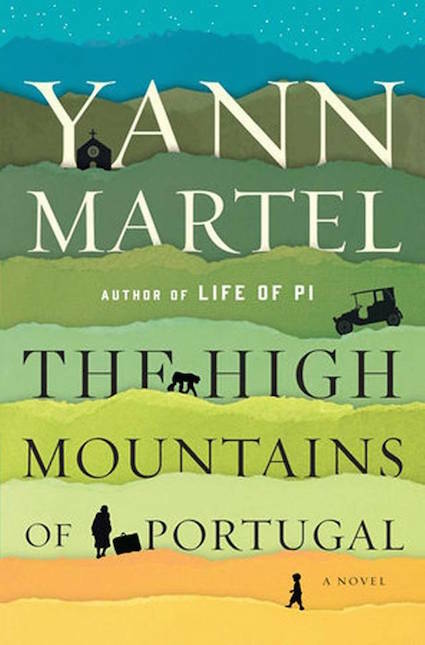 I’m sure Yann Martel’s novel The High Mountains of Portugal has by now caused the northern parts of Portugal to be overrun with readers clutching copies of his book, desperately searching not for Pokémon but for a little village and a little church with an odd altarpiece in the far northern mountain ranges, such as they are. But Portugal is pretty flat compared to, let’s say, Spain, its neighbour in southern Europe. The highest mountain peak is on an island in the Azores, southeast of mainland Portugal, called Mount Pico, at 2,351 metres. The actual highest mountain on Portuguese soil is Serra da Estrela (the Estrella or Star Mountains) at Mount Torre. But Serra da Estrela is in the north-centre part of the country, and is not a distinct mountain summit, but rather the highest point in a mountain range, and it’s only 1,993 m high. And while it has rocky outcrops, snow, even cliffs, Serra da Estrala certainly has none of the icy Alpine peaks and ravines of Europe. So, if you are looking for a high mountain range in northern Portugal, to where the luckless character in the first story in this book drives in his Peugeot in 1904, the most likely spot would be the Montesinho Natural Park, in northeastern Portugal. Montesinho lies on the border with Spain and sections of the southern slopes of the Serra da Coroa mountain range fall within the park. Its highest point is the 1,243 metres high Peña Mira, which is actually on the Spanish side of the border. The medium-high Serra da Coroa has woody slopes, summits with snow in the winter and odd-looking, rocky quartzite outcrops in the valleys. Like a mirage, the location of the high mountains in Yann Martel’s novel keep shifting – north, south, off-shore. The characters in each of the three short novels or chapters that make up the book seek things that may well not exist – that are either in their minds or some sort of folklore. What ties them together are the strange, non-existent high mountains of Portugal. A couple of decades later, the second character, “Eusebio Lozora“, a pathologist, working late at night, is confronted by a vision of his wife who explains her complicated theory about Jesus and the scriptures and Agatha Christie’s novels, and also by the wife of a dead old man on the slab in his laboratory. The woman – perhaps also a vision or a dream – comes from the aforementioned mysterious village in the high mountains, Tuizelo. A church in Tuizelo – perhaps the church? Tuizelo might not be in very high mountains, but it is indeed a real village, almost exactly as described in the novel, in the south of Montesinho Natural Park. Do a search and you will even see a picture of the little church that could well have been the site of all the fuss. In the last story, set in the present time, the leading character, “Peter Tovey”, a Canadian senator and politician, arrives in Tuizelo in the company of an ape. Note, an ape; an adult chimpanzee, not a monkey. He sees deep hills covered with scrub and cultivated land and those rocky outcrops, same as Tómas did. Mountains of Europe, using UNEP-WCMC 2000 global delineation, European Commission Report (rtrvd. from ec.europa.eu on 2016-08-02) Note location of Portugal, bottom left, Spain to the east and France to the north. But the thing with these characters is not that they are all off on wild-goose chases, but that they are so absolutely dogged about it and that all three are hoping for some sort of salvation or cure for their misery. This is why I think Yann Martel’s novel has by now caused the northern parts of Portugal to be overrun with readers searching for the little village and little church with the odd altarpiece. The hapless Tomás has his mind set on finding an “extraordinary” altarpiece referred to in an old diary he found, entitled “Being the Life in Words and the Instructions for the Gift of Father Ulisses Manuel Rosario Pinto humble Servant of God”, written in the 1630s. It describes the priest’s desperate life, and desertion of his faith, in tropical hell-hole Luanda, Angola, and the island of São Tomé. Here is a bit of an aside on the link between Angola and slavery: Angola is a former Portuguese colony which gained independence in November 1975. This was followed by a civil war which lasted more or less until 2002. Angola’s three main guerrilla groups, the FNLA, the MPLA and UNITA, agreed to establish a transitional government in January 1975, but started fighting each other well in advance of the actual independence date. With the support of the United States – sigh, does that sound familiar? – Zaïre and South Africa intervened militarily in favour of the FNLA and UNITA, with the intention of taking over the capital Luanda before the declaration of independence in November of that year. In response, Cuba intervened in favour of the MPLA which held Luanda and declared independence on 11 November 1975, with Agostinho Neto becoming the first president. At this time, most of the half-million Portuguese who lived in Angola fled the country. Luanda was a major market for slave ships during Portuguese rule. The city served as the centre of slave trade to Brazil from circa 1550 to 1836. This slave trade also involved local merchants and warriors who profited from the trade. In the 1750s, between 5,000 and 10,000 slaves were annually sold. By this time, Angola, a Portuguese colony, was in fact like a colony of Brazil, paradoxically another Portuguese colony. The slave trade was abolished in 1836, and in 1844, Angola’s ports were opened to foreign shipping. So there you go. A terrible place for centuries, and not only the colonists caused it, they also did it to themselves. “Father Ulisses” could do little about all this human suffering other than to pray for, read to and bless the slaves as they went to their deaths. He called the place “pestilential” and longed for home. Some years later, he is relocated to another Portuguese colonial outpost, wet and hot São Tomé, “a fleck of dandruff in the Gulf of Guinea”. São Tomé was founded in 1493 when the Portuguese came in search of land to grow sugar. Its proximity to the African Kingdom of Kongo in west central Africa (now northern Angola, the Republic of the Congo, the western portion of the Democratic Republic of the Congo, etc.) provided an eventual source of slave labourers to work the sugar plantations. The town of São Tomé is centred on a sixteenth-century cathedral, ironically, and it was the capital of the Portuguese colony of São Tomé and Príncipe which gained independence in 1975. This is the artifact that all three characters end up discovering. To find out how, and what it is, read for yourself. No spoilers here. It is a mystery, a theological treatise, a history of slavery in the Portuguese colonies, a detailed description of a post-mortem – but it is so wonderfully, realistically portrayed that, from the orchards, to the pathologist’s slab, that every moment is as sharp as a perfect photo taken at that time. Martel has a wonderful way of writing just on the edge of magic realism or fantasy. You have to let go a bit of your disbelief, and allow the very odd happenings to just sink in. He balances every strange incident with a completely sensible and plausible justification (even the senator living with an ape) while, at the same time, creating an atmosphere that is, at times, completely foreign, to such an extent that the high mountain region might as well be Mars and the villagers on the way there, tribes of zombie aliens. This – starting with the title which refers to a place that doesn’t exist – creates a distinct and bothersome tension in the novel that drives the reader on through all three parts to discover what is going on. I read it all in one sitting and ended up going a night without sleep. The disorientation and obsessiveness of the characters become less as the stories unfold, but only in the sense that what they experience is less physically extreme. It starts off really badly. Tomás, the poor schmuck, who literally blows himself and the car up when he goes to sleep in it with a lit lamp, is utterly defeated by his quest and the alarming, noisy, animal-like “machine” in which he runs over a child and the simply foreign, mystifying landscape. The chapters are titled “Homeless”, “Homeward” and “Home”, and in the last story the plot comes full circle. Peter, the senator, comes to retire in his ancestral home in Portugal, also the home to which Father Ulisses had sent his “artifact” and which Tomás was trying to reach, and also the “home” – a mental state – which Father Ulisses reached in São Tomé when he decried the cruelty of his fellow man and realized that “we are no better than apes”. The final moments of “Peter”, the old senator, and his ape, “Odo”, on a rocky outcrop near the village, are eerie and at the same time proper and absolutely right. Martel illustrates the basic “human qualities” of apes (I’m not anthropomorphizing here), and the animal origins and characteristics of man. Odo’s original caretaker comments that “when we study chimpanzees, we are studying an ancestral reflection of ourselves”. He also says, quoting Anthropologist and playwright Robert Ardrey; “we are risen apes, not fallen angels.” Martel depicts some characters as being not far from animals, and some animals, like Odo the ape (or the tiger in Life of Pi?) as less cruel and more companionable than many people. The relationships between faith and reason, imagination and reality, humans and animals are intertwined in the novel and are both intriguing and frustrating to the reader. However, Martel does it so well that, at least for this reader, intrigue wins out. To make a long three stories short: it is a terrific book and absolutely un-put-down-able. Yann Martell won the Man Booker Prize for Life of Pi. ‘Nuff said. He is pretty darn famous, he has crazy hair, and he is Canadian. I have read, and own, The Facts behind the Helsinki Roccamatios (four short stories), by Martel. It won the 1991 Journey Prize and since, as yet, I have not quite figured it out, I’ll have to keep re-reading it until I do. Strangely, he wrote letters about books to the office of former Canadian Prime Minister Stephen Harper, and sent his office a book every fortnight, starting in 2007. Seventy-six books and three years afterwards, Yann reported that it was a case of “very occasionally receiving a response from Harper’s office but more usually sending the books – from Alan Bennett’s The Uncommon Reader to Chinua Achebe’s Things Fall Apart – into a void.” Eventually, Yann included recommendations from other writers. The letters and list of books are collated in 101 Letters to a Prime Minister (2012). Why did he do it?